This September I am excited to announce the first film festival based on this project. The Taxi Takes on the World @ Celebrtaion of Peace (Jashn-e-Aman) Film Festival will be held in 4 states in India, from September 21st - October 2nd, 2013. The film festival is part of a larger event that is organized by the Non Profit STEP - Standing Together to Enable Peace Trust, based in New Delhi. They will be handling all the logistics of the film festival while I will be curating all the taxi take videos to screen in Kashmir, Punjab, New Delhi and Manipur. I already have a line up of videos that have been submitted from Cairo, New York City, Afghanistan, Mumbai, Montreal and Beijing. I know that there are a few more videos that will meet the deadline and so Indian audiences will get to hear and see a diversity of voices and people in these taxi takes! As many of you may or may not know I have lived in Bozeman Montana for the past 3 years. While Bozeman may not be the taxi capital of the world, I've been extremely lucky to find the community here so interested in The Taxi Takes on the World, and so my plan is to, after the festival in India, bring back the taxi videos to Montana. For this I need your help! I am in the process of organizing a unique event in town. In my time here, I've had repeated requests from several folks, strangers and friends, to open up an Indian restaurant in town. 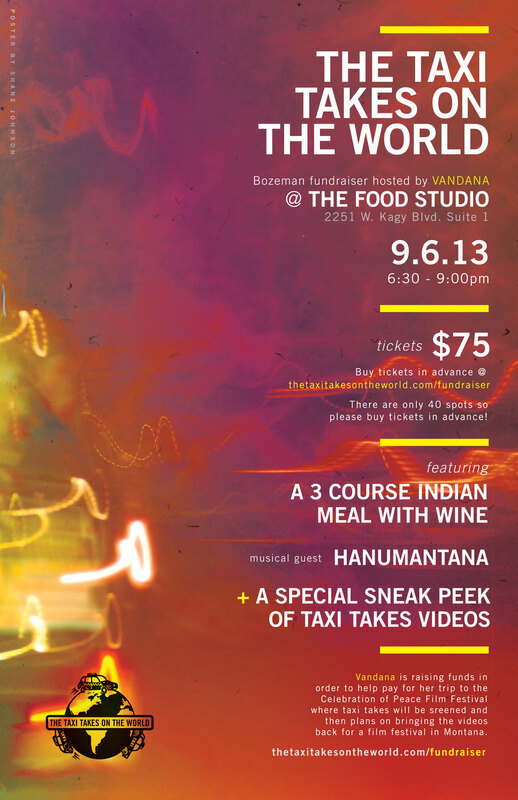 While I can't do that, what I can do is have a big dinner event featuring cuisine from India. This sit down dinner will be hosted at The Food Studio with their long family style tables and a vibe and décor that scream contemporary elegance. The plan is to have a 3 course dinner starting with a paneer (Indian cottage cheese) appetizer and a glass of wine as you walk in. During this spicy cocktail time people will be serenaded by a wonderful local band I helped start called Hanumantana. Hanuman, the mythical monkey God from India comes to Montana in this Indo-Western fusion band that comprises Russ Leonard (Sitar), Jake Flemming (guitar), Ken Glynn (tabla) and Ankur Saxena (vocals). The band was conceived with the same concept as my film project of bridging cultures. By now attendees would be ready for a bigger appetizer and the music will continue and small plates would be served. I plan to screen some of the videos I have already received for everyone next. So, as you start digging into the main course that will be ‘chicken tikka masala’ and ‘sukhe aloo’ with aromatic basmati rice and a drizzle of coriander and green chili yogurt, I will fill you in on this crowd sourced interactive documentary of mine. The night promises to be a warm heady mix of spicy Indian flavors, exotic tunes and sounds, and films that will let you step into taxis from around the globe and listen in on intimate eye opening conversations. We live in troubled times and with my work I am trying to recapture spaces where strangers meet, connect and overcome stereotypes and boundaries. In spite of all the social media communication in the world I find that we are actually more wary of our neighbors and new cultures. In my project The Taxi Takes on the World I aim to create a portal where heartfelt moments are captured which educated and enrich our lives about human connectedness. To support me in this fundraising initiative, please consider being a part of this evening. Your support will help me to cover my costs for going to India and then helping me to bring back the films here so that I can hold The Taxi Takes on Montana Film Festival! To reserve your spot for the evening please sign up with your details below.